If you’re interested in interactive toys, smart accessories, or light-up fashions, this book is for you! 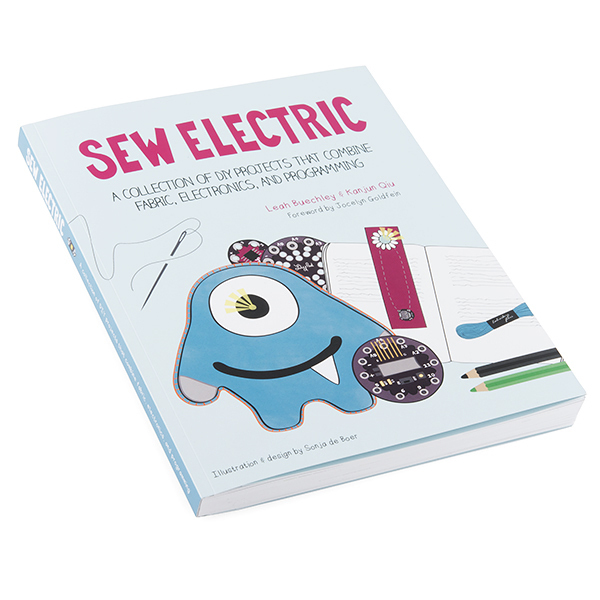 Sew Electric is a set of hands-on LilyPad Arduino tutorials that bring together craft, electronics, and programming. 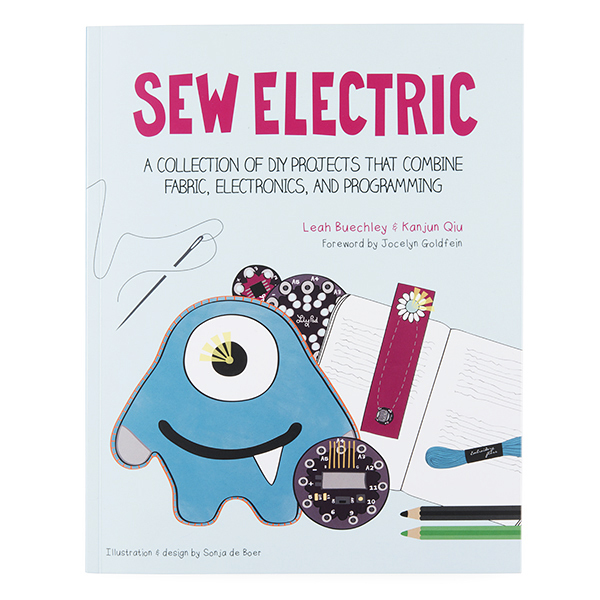 The book walks you through the process of designing and making a series of quirky customizable projects including a sparkling bracelet, a glow in the dark bookmark, a fabric piano, and a monster that sings when you hold its hands. Play with cutting-edge technologies and learn sewing, programming, and circuit design along the way. It’s a book for all ages. Explore the projects with your friends, your parents, your kids, or your students! On page 115 and 116, it goes over how to include the readCapacitivePin() function definition by adding a new tab and pasting the code from this website => http://sewelectric.org/misc/capacitivesensingcode/ . I did notice that when the pins for the keys were touching, it would cause the LilyPad SimpleSnap to play notes even when I was not touching the pin. This would happen when the project was running on its battery or when connected to a computer. Try checking for loose connections and removing any shorts. The buzzer would also go off if there was a long piece of the alligator cable or wire attached while the FTDI was attached to the board. This is probably due to the change LilyPad SimpleSnap's total capacitance when your computer is attached. I would avoid having long conductive thread from the LilyPad SimpleSnap's pin. A third case where the buzzer would go off is when I had a very long piece of alligator cable or wire attached to a pin. The LilyPad SimpleSnap was just powered by its battery and not connected to a computer. The pin would detect a difference in capacitance when the wire was hovering over itself. 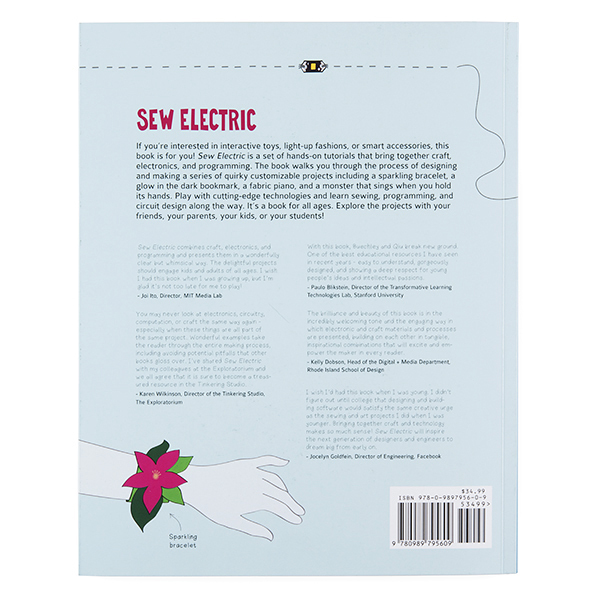 The Sew Electric book does talk about loose connections and shorts on page 151 and 512. Try looking at those pages for more information. Using a multimeter set to the continuity setting, you can also check for shorts [ https://learn.sparkfun.com/tutorials/how-to-use-a-multimeter#continuity ]. What can help is adding a M/F premium jumper wire to GND. There might be a weird capacitance issue depending on how the fabric piano was made and this would stabilize the sensor values. Adding a layer of conductive fabric and a non-conductive piece of fabric under the keypads and LilyPad SimpleSnap (assuming that the conductive whiskers to not touch the conductive thread) will also help in stabilizing the values.